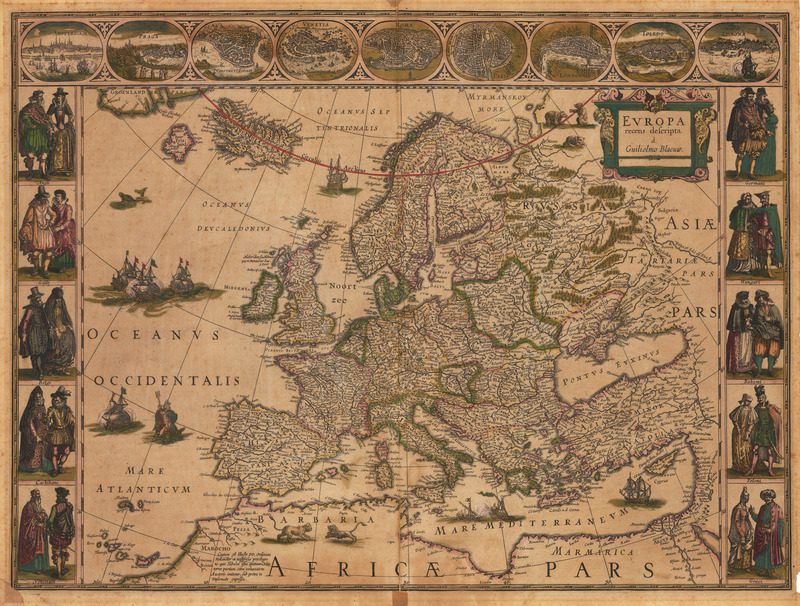 This is a fine example of Blaeu’s iconic map of Europe produced during the golden age of Dutch map making. The map shows in detail the geo-political landscape of early 17th century Europe and extend far enough to include the northern coast of Africa, the Holy Land, Asia Minor, Russian Europe, Iceland, part of Greenland, and the mythical island of Frisland. The upper frieze contains nine bird’s eye views or maps of important European cities, including (from left to right), Amsterdam, Prague, Constantinople, Venice, Rome, Paris, London, Toledo and Lisbon. Flanking the map are ten portraits of various peoples dressed in their traditional garb of the era. The map is lavishly embellished with numerous sailing ships, some in battle, Neptune or Poseidon riding a whale while holding a trident and a vignette of a three bears in the northern portion of Russia. Condition: This map is in C+ condition with original color. Slight foxing is apparent throughout but more prevalent in the bottom center portion of the map. Upper and lower centerfold separations have been repaired on the verso as well as a marginal corner replaced with contemporary paper in the lower left.